*The Metro-Manhattan Chapter of the Links, Inc., a non-profit organization, strives to enhance the quality of life in the Harlem community through the four facets structured by the national organization’s Services to Youth, The Arts, International Trends and National Trends and Services committees. Further, the distinguished organization is dedicated to substantially impacting the quality of life for children and families in Greater Harlem through arts, education and leadership development. 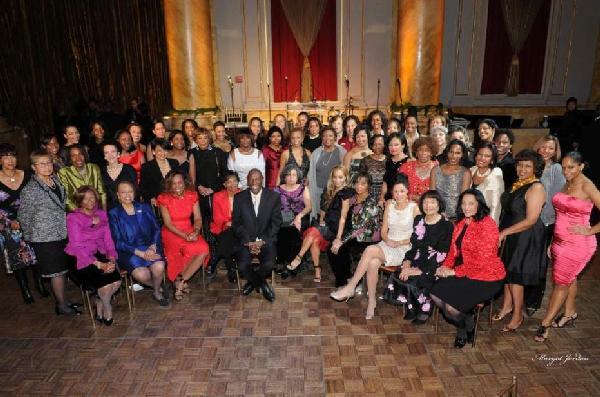 On Sunday, December 12, 2010, over 500 guests joined the pristine women’s group at its celestial tenth gala at Capitale in the Bowery as they celebrated dedication and commitment to education and educational achievement in Harlem by honoring Geoffrey Canada, president and chief executive officer of Harlem Children’s Zone (HCZ). HCZ is a community-based organization serving over 17,000 children living in a 100-city-block area in Harlem, New York City. Honorary chair Kathryn C. Chenault presented Canada with the award. Metro-Manhattan Links and HCZ have the common goal to create safe, stable and encouraging environments for Harlem children and families. Both organizations work tirelessly to increase the number of Harlem children who will graduate from middle school, high school, college and graduate school. “We are proud to honor Geoffrey Canada for putting a line in the cement sidewalk of upper Manhattan and declaring that we will educate our children, we will support our families and we will grow stronger as a community,” said Anna Maria Bishop-Harris, president, Metro-Manhattan Links. “We celebrate Geoffrey Canada’s inspiring dedication, ground-breaking practices and the tremendous difference his work has made in so many lives,” added Bishop-Harris. Another highpoint of the stellar evening was a special recognition award presented to the Governor and First Lady of the State of New York, David A. Paterson and Michelle Paige Paterson, by honorary chair Alma E. Rangel for their unwavering support of Metro-Manhattan Links’ Harlem-based programs. Award-winning CBS 2 News anchor Maurice Dubois served as master of ceremonies for an evening of convivial cocktails, silent auction, dinner and dancing. In tribute to Canada, the Harlem-based Millennium dance group for young girls, supported by the Metro-Manhattan Links, performed a special presentation and the Total Package Band provided soulful dining and dancing music throughout the evening. The fundraiser also served to launch the Metro-Manhattan Links’ nationwide expansion of its 12-year-old Young Achievers program initiated twelve years ago by Link Barbara Martin, chairman of the Young Achievers program, as part of the Metro-Manhattan Chapter’s community outreach and educational focus. “The Links understand the seriousness of the issue at stake for their community. The Links are responding to the very real need to help our young men stay focused on getting a good education,” stated Martin. Honorary chairs for the gala were Kathryn C. Chenault, Corbett A. Price, Alma E. Rangel and Donna Williams. The gala committee consisted of Betty Phillips Adams, Valerie Lancaster Beal, Patricia Bransford, Lavonnie Brinkley, Peggy Byrd, Martha Cameron, Camille Jackson Clark, Dawn Hankin Cliette, Kim Copeland, Toni G. Fay, Rozalynn S. Frazier, Diane Black Greene, Elaine Joaquina Griffin, Tiffany Hall, Tracey Brown James, Karen Johnson, Harriett Mandeville, Pamela Palanque North, Marquita J. Pool-Eckert, Jennifer Randolph, and Inez Richardson.